Golf photography is unlike any other sport. There are so many facets to it – the style, emotion, scenery – it’s fascinating, yet overwhelming. A golf photo has versatility. For instance, there are golf photos appropriate for the guest room bathroom, then there are photos for the living room and if daring enough, the dining room. Regardless of style or taste, each photo has a place in a golfer’s home. This post shares 7 golf photos and where they could go in your house. In 1930, the year Bobby Jones won the Grand Slam, the British Amateur was held at St. Andrews. Below is a picture of Bobby Jone being hoisted by the crowd as he holds up his famous putter, Calamity Jane. Bobby became such a crowd and city favorite, in 1958, he was awarded with the Freedom of St. Andrews. The only other American bestowed with such honor was Benjamin Franklin. Watch his acceptance speech here. The game and cigarettes have always had an interesting relationship. After reading Bernard Darwin’s essay titled The Golfing Cigarette, a post was warranted. Growing up, cigarettes were a part of my experience – the long drag remains in my father’s pre-shot routine. There is the one that a man lights on the tee just to steady him and help him over the first hole. There is the one, particularly applicable to medal rounds, which follows a disaster in a bunker leading to a six or a seven. There is, in a match, the one that is felt to be absolutely necessary when a nice little winning lead of three up or so has suddenly been reduced to a single hole. There is the cigarette to be smoked at the turn, irrespective of the state of the game, but because the turn is a definite occasion and an occasion calls for tobacco. Golf and cigarette’s relationship has been like any other; good times and bad times ebb and flow. In the early years of competitive golf, it was viewed as disrespectful to smoke in a match. Americans slowly morphed the perception as even the great Bobby Jones took a few drags during critical moments. Unquestionably the pinnacle of golf and cigarette’s relationship was during the commercialized boom years of golf. The years of post-war golf seemed to curb the stigma and when the likes of Ben Hogan and others made it a habit, the act was more accepted; proven by the King’s promotion of LM’s (image below). 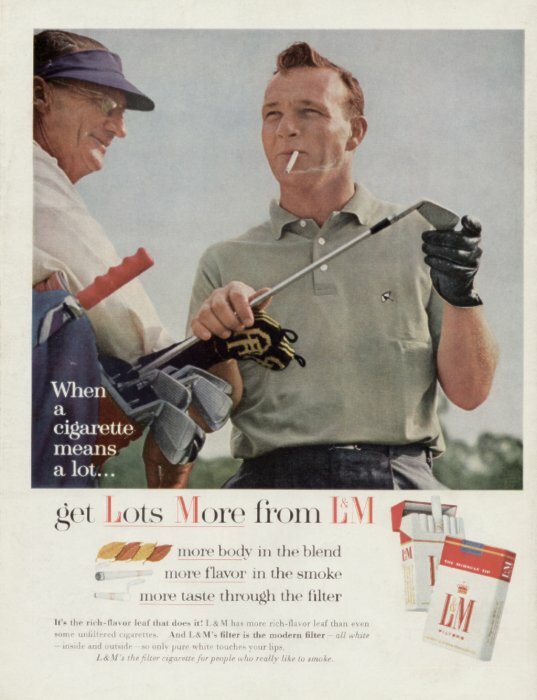 The relationship of cigarettes and golf today is still strong, but more subtle. Although, an opponent lighting up a Camel is in no sign of disrespect, it’s more likely to be perceived as a weakness. Vernacular has even changed. Smoking cigarettes, is no longer called smoking cigarettes, but ‘ripping nails’ is just as easily interpreted in the golfing elite’s terminology. Cigarettes and golf will always be married together. Both need each other: cigarettes because without golf, there would be less moments needed for them, and golf, because without cigarettes, the game would be that much more difficult. 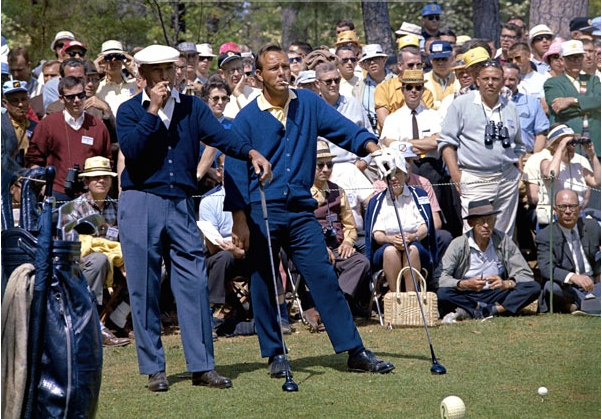 Arnold Palmer and Ben Hogan smoking cigarettes before their shot. 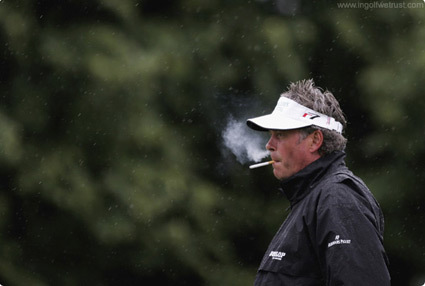 Darren Clarke smokes a golfer's cigarette. 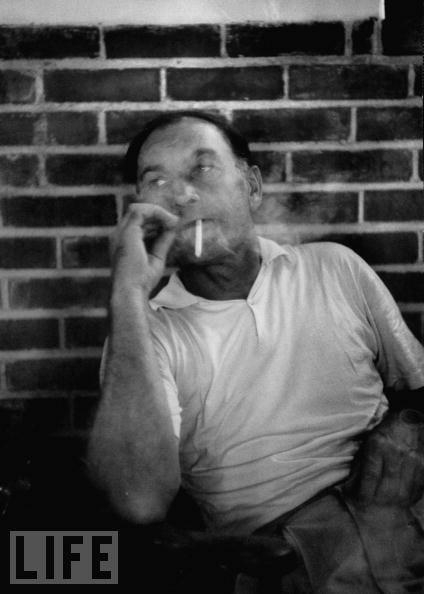 Post-round cigarette for Ben Hogan. 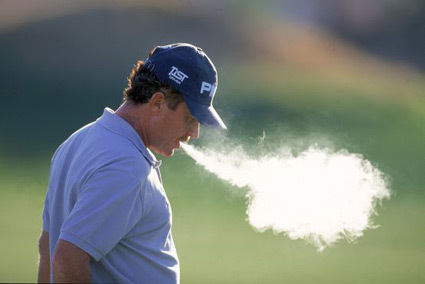 Miguel Angel-Jimenez smokes cigarettes and cigars. 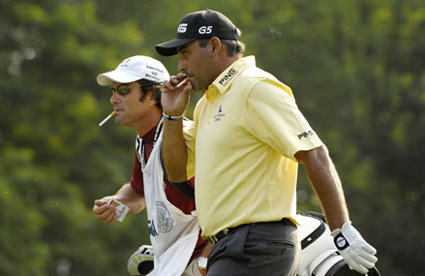 Angel Cabrera is one of the most prolific smokers on tour. Information is power, right? 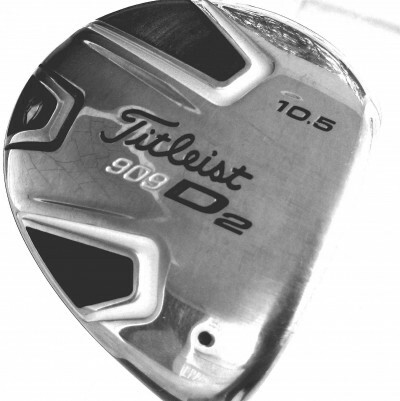 We’ll finish off our series on equipment-buying with a few web resources for the most die-hard wedge-heads among you. The links below represent my three favorite time-drains, ranked in descending order by hours squandered. We’ve covered the driver, and now it’s time to discuss irons. In this post, we’ll address the basics. Next time, we’ll talk about how to make sure you get an iron with specs that fit your swing. Cast irons are made by pouring molten metal into a mold. Forged irons, on the other hand, are made by pounding and shaping a heated chunk of metal. Cast irons tend to be harder, forged irons softer. If you like a harder feel at impact, go with cast. If you like a softer, sweeter feel, go with forged. In the end it’s simply a matter of preference. Is your driver more than three years old? If so, golf club manufacturers would say it’s time for a new one. I was skeptical too, but when I finally bit the bullet and bought a modern driver, I couldn’t believe the difference (and my old driver was only five years old). If you’re serious about your game, it’s well worth the investment. Finding the right driver isn’t hard. Contrary to popular opinion, you don’t need to pay anyone to tell you what you should be swinging. You can do it yourself — you just need to know what to look for. We’ll spend this post discussing the four simple factors to consider when buying a driver, and then next time we’ll talk about how to get it done. The higher the loft on your driver, the higher the launch angle and the more backspin. For players who have faster swing speeds (generally better players), too much loft can be detrimental. More loft creates more spin and more height, and this leads to high ballooning shots that get caught in the wind and don’t go anywhere. On the other hand, for those with slower swing speeds, higher loft will help get the ball started on a higher trajectory, and this will increase carry distance. Thinking about spending your next paycheck on some new clubs? Great! This is the first installment of your golf equipment-buying guide. 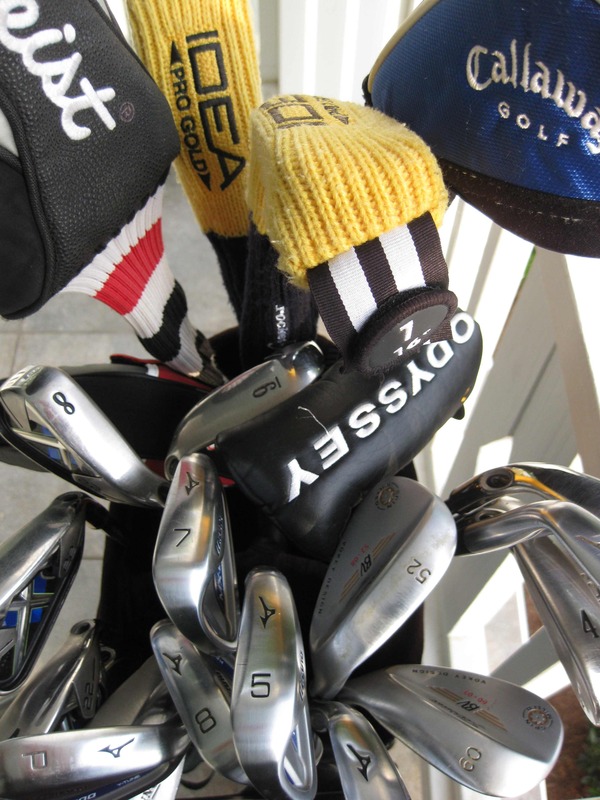 For better or worse, I spent the last year systematically replacing every club in my bag. Along the way, I learned a few things that you may find useful. Let’s clarify a few things before we even begin to contemplate heading out to kick the tires on the latest and greatest in golf equipment. Myth #1: I’m not good enough to buy new clubs. Thinking about buying new clubs? I think I can help. For better or worse, I’ve spent the last year systematically replacing every club in my bag. Along the way, I’ve read equipment reviews, talked to club pros, hit hundreds of balls with dozens of clubs, bought clubs, sold clubs, traded clubs, gotten fitted for clubs, watched other people get fitted for clubs, spent too much time in Golf Galaxy, experienced buyer’s remorse, and finally ended up with some sticks I’m happy with. If I had to do it all again, I’d do it much differently.